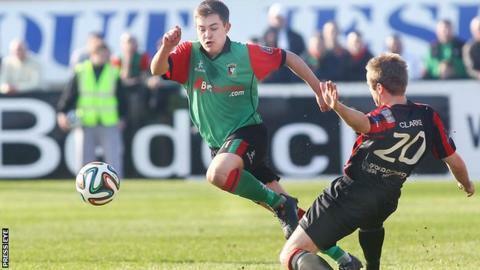 Glentoran have suspended attacking midfielder Jordan Stewart for two weeks because of a "breach of contract". The 20-year-old was handed the punishment after playing for another club last Saturday. "The player recognises that he should not have done this," said the east Belfast club. "Whilst he remains a key member of our playing staff, contracts exist to protect both the player and club's rights." Stewart, who recently committed to a long-term contract with the Glens, is a key member of Eddie Patterson's side and helped the team to Irish Cup success in May. His suspensions ends before the Premiership opener against Coleraine on 8 August.